Margaret Thatcher’s legacy is the subject of huge contention – this was not unexpected. Her tenure as Prime Minister of Great Britain polarised public opinion in equal measure. Some believe she resuscitated post-World War II Britain from its position as ‘the sick man of Europe’, bringing prosperity to it through her support of the free market ideology and neo-liberal policies. Her political philosophy and economic policies emphasised deregulation (particularly of the financial sector), flexible labour markets, the privatisation of state-owned companies and reducing the power and influence of trade unions. Others believe that she improperly advocated individualism at the expense of society’s needs as a whole, with obvious detriment to the poor. If one is left-wing and prefers a welfare-type, ‘free-milk for all children’ state, one will obviously exhibit disdain for the free-market ideology Margaret Thatcher so resolutely stood for. This debate is not new. In fact, it represents the perpetual Capitalism vs Communism debate – to which there is yet to be any proper conclusion. Thatcher’s contribution to the debate is self-evident, documented and does not beg repetition here. What the world perhaps did not expect was to hear hate of the Iron Lady emanating from proponents of feminism. By feminism’s very definition, it seeks to promote political, economic and social equality between men and women. Margaret Thatcher proved this notion to be a viable one: She read chemistry at Somerville College, Oxford in the 1940s (then a huge achievement for a woman of her background) before becoming a barrister. She was elected Member of Parliament for Finchley in 1959. Edward Heath appointed her Secretary of State for Education and Science in his 1970 Government. In 1975 Thatcher defeated Heath in the Conservative Party leadership election to become Leader of the Opposition. She became the first woman to lead a major political party in the United Kingdom. She became Prime Minister after winning the 1979 General Election. Margaret Thatcher was the longest-serving British Prime Minister of the 20th century and is the only woman to have held the office. Her dramatic rise to power showed that women could penetrate the glass ceiling and that they were as competent as their male counterparts.Feminists ought to have been Thatcher’s loudest cheerleader; and Thatcher ought to have been an icon for feminism. Ironically, (pun unintended) this was not to be so. Feminism’s main indictment against Thatcher rests on the allegation that, having achieved power, she did precious little to improve the lot of women either in politics or outside of it during her eleven years in Downing Street. Sophy Ridge notes that as prime minister Thatcher froze child benefit, criticised working mothers and only promoted one woman, Baroness Young, to her cabinet. When Thatcher banned free school milk for children in primary schools over the age of 7, earning her the nickname “Margaret Thatcher, Milk Snatcher,” she was the living opposite of a nurturing mother. Ridge quotes former Labour minister Patricia Hewitt, saying it is a “tragedy” that having broken through the “glass ceiling” in politics to become prime minister Thatcher then “did so much to undermine the position of women in society”. A trawl through the Thatcher autobiography sees no mention of any women at all apart from Young, her secretary, her daughter, Indira Gandhi and the wives or daughters of other statesmen. Edwina Currie, Virginia Bottomley, Gillian Shephard and Angela Rumbold are conspicuous by their absence. Her official biographer, Charles Moore, wrote in 2011 that she “benefited from the emancipation of women without showing the slightest interest in it.” It is further argued that Thatcher had such command over her Conservative Party that if she had chosen to do so she could have advanced large numbers of qualified women into public and political posts. She chose not to do so – this has been described as a missed opportunity. It is abundantly clear, albeit incongruous, that the relationship between Margaret Thatcher and feminism is characterised by mutual disdain. This is unfortunate because the idea of Margaret Thatcher as a feminist is a perfectly good one on paper. It is a dilemma which is easy to resolve – and in typical Thatcher style, there is no middle ground! Given a choice between feminism and Thatcher’s approach, one must certainly pick the latter. Women must not be made to get ahead simply because they are women. The discourse needs to go further than that. Edwina Currie made the point when she stated that “I think [a feminist-type approach] led to Labour in particular wanting to make it easier for women to come up the system and they created all women shortlists and rubbish like that, and the net result of that was many women arrived in parliament but actually weren’t very good at doing the job.” Nothing can be gained from that. In fact, it is an affront to the capabilities of women to require quotas in order for them to succeed. This is the ‘poison’ to which Thatcher quite rightly refers. 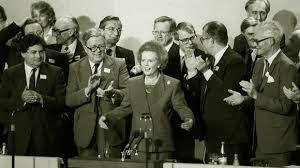 Thatcher’s way is to take individuals on their merits, not as they are associated in groups. One must not feel compelled to reverence simply because someone was the First Lady or the Only Lady. Feminists simply complain bitterly that it’s somebody else’s fault that they haven’t got to the top. Margaret Thatcher just figured out how to do it and took the opportunity to stick her neck out and get the job done. Women, no matter their political philosophy, must applaud her for so doing. To do otherwise would validate the theory that when a woman succeeds in breaking the glass ceiling, instead of congratulating her, other women are quick to pick up the broken glass and cut her with it. Women must aim to be the best they can be, competent in the jobs they perform and resolute in their quest to succeed. It is ironic for feminism to oppose this.